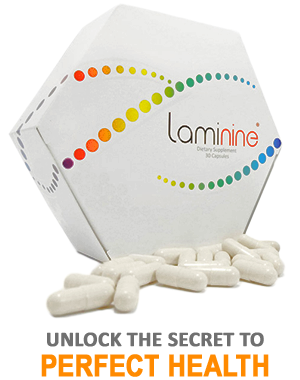 Laminine is a Natural, Synergistic Super Food, (many refer to as The Happy Pill) that contains 22 amino acids, trace minerals, vitamins and Fibroblast Growth Factor (FGF). Optimal nutrition for your body, it gives your stem cells nutrition to rebuild and rejuvenate themselves. 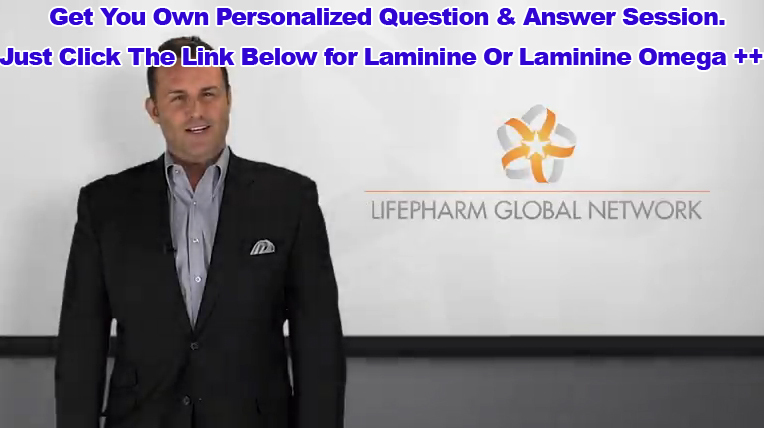 Laminine is a unique and patented formula that provides essential proteins and amino acids. These amino acids contain the proper transport mechanisms that direct these nutritional building blocks to where our body needs it most. 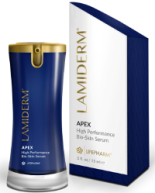 One of The Most Important Laminine Ingredients is Fibroblast Growth Factor (FGF). Found in the fertilized avian egg, Fibroblast Growth Factor speeds up tissue healing and improves cellular health. 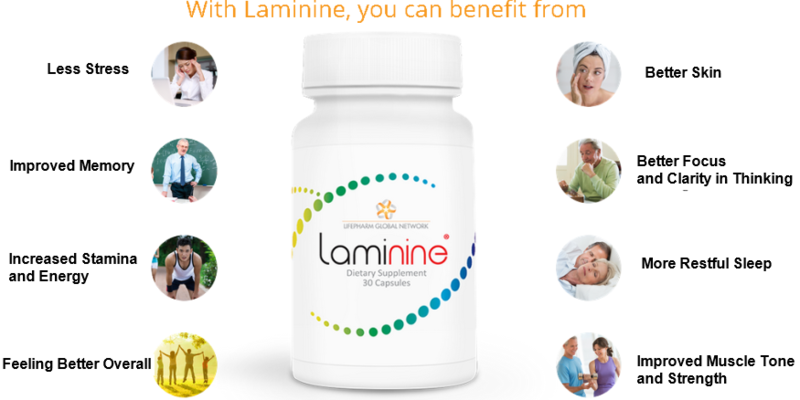 The combination of Fibroblast Growth Factor, amino acids and vitamins in Laminine deliver amazing health benefits. This natural, synergistic superfood contains most known vitamins, important trace minerals and eight essential amino acids sourced from land, sea and plant. Laminine unleashes a powerful repair mechanism inside all of us. It can bring physical, mental and emotional health to a new level. Laminine has a variety of potential health benefits, including strength, stamina, focus, improved sleep, increased libido, and sense of wellbeing. These various effects may all be related to the significant reduction of the stress hormone cortisol following the ingestion of Laminine . Laminine is a form of a natural ‘adaptogen’ helping to create a state of balance and restoration, returning the body to its natural state of homeostasis. We recommend 2 capsules, twice a day for the first 10 days, and 1 capsule, twice a day thereafter. Researchers also found out that FGF plays an important role in the fertilized avian egg, which translates in a vast range of health benefits. FGF directs the amino acids and peptides to the right parts and cells of the body. It plays a vitally important role in “telling” cells what to do with these nutrients and how to utilize them properly. FGF plays another important role – it nurtures the stem cells of the body itself. FGF is a unique extract that is not present in other amino acid formulas. In the late 1920s, Canadian Dr. John R. Davidson discovered an extract derived from the tissue in fertilized hen eggs at a precise point during the incubation period. It wasn’t until almost 50 years later that the pursuit of fertilized egg extract was revived by Norway’s foremost expert on egg research, Dr. Bjodne Eskeland. Dr. Eskeland hypothesized that partially incubated, fertilized hen eggs contained a unique combination of amino acids, peptides, and protein fractions that could help provide an incredible array of health benefits upon consumption. It was found that on the ninth day of fertilization these partially incubated, fertilized eggs theoretically contain all the nutrients required to start a new life. This includes vitamins, minerals and proteins, as well as important defense factors, growth factors and hormones. It is during this very precise moment on the ninth day that this highly potent tissue is extracted.